Every room in your home should be a place of relaxation. Including your bathroom. The bathroom is a place in your home where you get ready in the morning. You will want to have a sense of fresh energy before you take on your whole day. 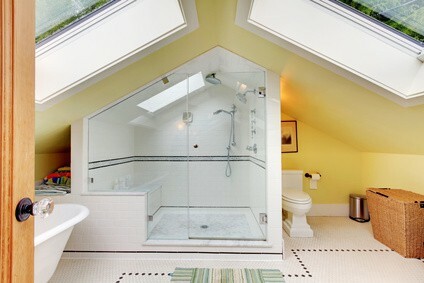 On the other hand; the bathroom is also a retreat at the end of your day. There is a way to make both ends of the spectrum work together to make your bathroom more relaxing. An easy and cheap way to do this is to take a look into your bathroom paint colors. They do play a major role in how this room will effect your mood. How does a certain wall color affect your mood? There is a certain science behind it all that starts with what gender you are, your age, race, personality and mental state. Studies show that males prefer colors that have a deeper tone (reds, blues, black). Younger people like colors that are bold and stand out (purples, orange). Certain colors will promote happy emotions like yellows. A grey bathroom could make you feel bleak and unmotivated. Your bathroom paint colors will set the stage to how you will go about your day or night. Let’s take a closer look at some examples. 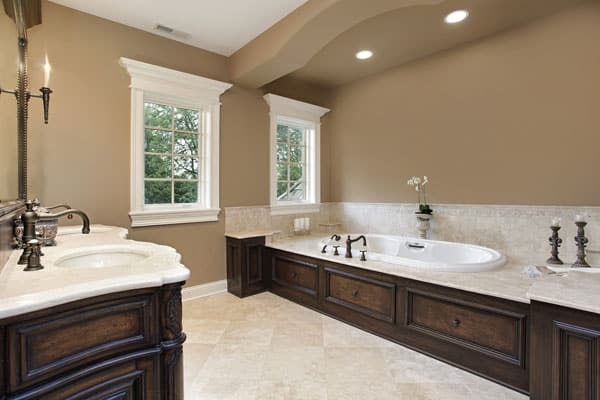 All tans and browns are a great warm color choice when searching for a relaxing bathroom paint color. Also, they are a perfect color if you are putting your home on the market. This hue is an allround rich and comforting choice. If you are thinking about using bathroom paint colors that are bold, but don’t want it to feel overwhelming you can use it on one wall as an accent color. This way you are breaking up the color scheme without losing your favorite color. When you are working with bathroom paint colors for small spaces you will do best with lighter color schemes. They make the bathroom feel larger. The photo above used a Canary Yellow to brighten the bathroom. Yellow works well it makes it feel sunny and happy. What a wonderful color to start your days. In most cases people don’t want all white walls surrounding them. A touch of color will do a great deal in making your bathroom more relaxing. The photo above is using a off white paint on the cabinets and a light clay color as a backdrop on the walls. Add a few flowers to give this room a pop and you are well on your way to a peaceful night. In the end which ever color you choose for you bathroom paint colors relaxation truly sets in when you are in your master suite. Why Paint In A Minnesota Winter?